Direct Selling Industry offers lucrative employment opportunities because of multiple reasons. This simple form of selling through a non-store format has revolutionized the retail industry. Being a flexible employment proposition, direct selling attracts millions of people who do not see their future in a 9 to 5 job with big corporations. The growing popularity of direct selling has given birth to many interesting trends that are shaping the future of people active in this industry. These trends are capable of reforming the industry’s revenue-generating capabilities. This article explores some popular trends in the industry that are crucial to understanding the overall picture in the direct selling industry. These trends are the dominant trends in 2019 that will continue to impact the consumer behavior and entrepreneurial scope in the industry are discussed below. Baby Boomers who have retired, Generation X who is on the verge of retirement and Millennial who wish to be their boss, all workplace generations foresee their future with direct selling industry either as affiliates or entrepreneurs. With the upsurge in technology and changing consumer patterns, the speed with which trade is flourishing is appreciable and promises to give ample scope of development in the future. Direct selling software has proved to be a game changer. Numerous companies are joining hands with MLM software companies to procure popular MLM software to streamline and automate their business operations so that they can focus on core sales. Consumers are inclining towards personal shopping experience instead of online shopping as it allows them to touch and try the product they wish to purchase. 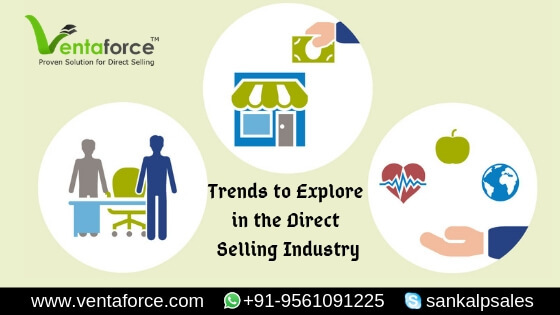 So in the coming future, direct selling will gradually swipe online selling because of high propensity for personalized connections with customers present in the MLM industry. Direct selling industry offers a vast scope of earning as a part-timer as well as a full-timer. Retired people enjoy working on and off as direct sales affiliates. The younger generation is sparked by the idea of starting their venture in the direct selling industry. With the rise of social media platforms, virtual collaboration has greatly helped distributors and customers in the direct sales industry. It will be going to rule as direct sellers can leverage these channels for mobilizing the sales and educating people about their products. Not only health, household and wellness products, MLM companies now sell fashion products, accessories and agricultural products. The list will expand with time as more and more consumers look for personalized interactions. Nowadays, MLM companies are devising their MLM compensation plans to serve their affiliates most suitably. With help from experts, companies tend to customize compensation plans by picking the best features from different plans. The idea behind this approach is to keep the sales force happier than ever. Just like other businesses, the direct selling industry is all set to assimilate data analytics in the business strategies to act according to the market needs. Data analytics helps strengthen the value delivery chain by making it more customer-oriented and proactive. Mobile apps are in trend as they reduce communication and information barriers potently. With the feature of managing the entire portfolio on mobile apps, direct sales affiliates can perform better and generate more revenue for their companies. Customers sit at the first level of marketing strategies of the companies. Direct selling companies are also adopting such mechanisms that give utmost importance to consumers’ perspectives so to develop customized pitching strategy for catering their specific needs. Conclusively, the direct selling industry is on the rise. It is forwarding towards substantial growth while benefitting its practitioners and customers. It is crucial to understand and follow the mentioned above trends for exceptional results.